The walnut tree facts are pretty straightforward: nearly all walnut varieties in America are either Persian walnuts or a variety of the black walnut. The black walnut in particular is highly valued for cooking, but all walnuts can be good for you. A number of studies have shown the value of walnuts for brain function. Getting seeds shouldn’t be much of a problem, either, as 38% of all walnuts grown are raised in America. Here are the walnut tree facts you need to know specifically: First, they’ll grow nearly anywhere that doesn’t freeze too deeply in the winter. Second, they do require full sun and soil that’s deep and fertile. One of the best walnut tree facts for urban gardeners is that their roots don’t spread very widely, so they’re unlikely to crack a foundation. Finally, walnut tree facts include that they prefer moderate summers, and/or high humidity, and soil that drains well. If you live in the South, you likely have plenty of pecan recipes, and there’s a reason for that. Pecan trees can thrive nearly anywhere except in very harsh cold climates, but since they have very spreading roots, they must be planted a minimum of 30 feet from buildings. This means they’re more suitable for urban and suburban areas with more available spread than in a small yard. The pecan tree is also quite beautiful, so plenty of people plant them with no intention of actually harvesting; but pecan benefits include, according to Loma Linda University, causing an increase in blood antioxidant levels for 24 hours after eating: so go ahead and harvest. These are highly prized as yard ornaments, and you’d be hard pressed to find a nicer-looking tree. They’re also smaller than a lot of nut trees, so if space is at a premium you might like the chestnut. They’re also pretty easy to grow, although the American chestnuts are subject to blight. This means that if chestnut trees are already everywhere in your neighborhood naturally, the chances your tree will get blight is pretty high. If the chestnuts aren’t already around you, great. American chestnut trees will probably do fine. If your area is already dense with American chestnuts, though, fear not. You can always go with the Chinese chestnut variety, which is more immune to blight. One important thing to know: chestnut trees need each other to pollinate, so if you want to actually get nuts you’ll need to plant two of them near one another. Pistachio health benefits are frequently touted and quite well-known. You might be pleased to know, then, that they are actually pretty easy to grow, too, if you live in a place with long, hot summers that kill other types of nut trees. They do take a while to mature, though. They don’t really hit their stride in terms of nut bearing until they’re 15 to 20 years old; but once they mature they’re very fertile. A mature tree can give you as much as 80 pounds of pistachios! 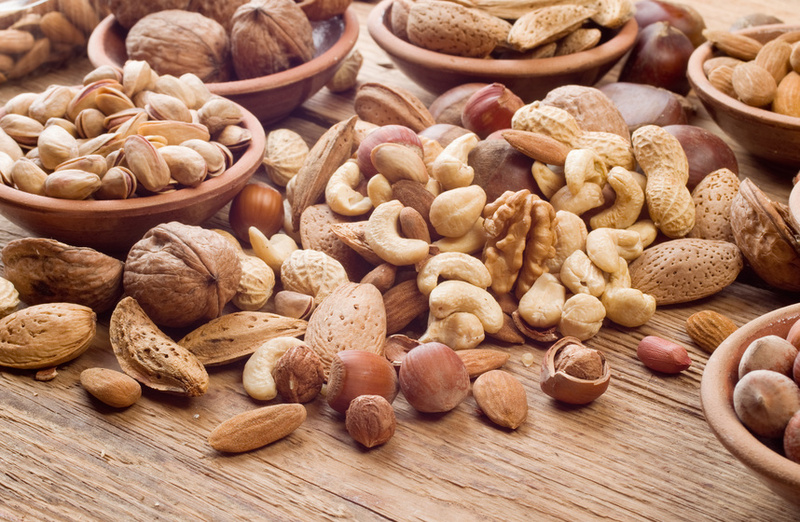 Nuts and seeds are great nutrition powerhouses, and the trees that bear them are beautiful and functional, too. If you’re looking for way to get into growing things, but don’t have time or space for something like a vegetable garden, consider getting some nut trees.